Are you in need for the best tents for your event? We are the leading marquee tent hire Durban North wide, capable of delivering tents of various shapes and sizes that are suitable for your wedding, party or any other event that you might be planning. Adaptable to different kinds of terrains, our tents are guaranteed to create a lasting impression that will stay in the minds of your visitors for a long time. We are only a phone call away, so pick up and the phone and talk to us direct on 031 100 1905! Our affordable tents for hire in Durban North are available throughout the area at short notice. 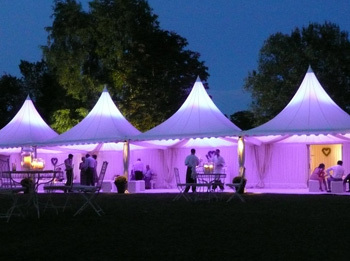 Should you need to make a booking for a wedding tent or a party tent, we are available for you. Whether you need double king pole marquee tents or peg and pole tents, we have a huge selection that is 100% waterproof. Our qualified team is more than ready to provide a solution to all your tenting needs. Therefore, get in touch with us for a wide selection of tents for hire that are suitable for a small personal event or a large fete or fair. We always deliver exactly what our customers are looking for. Therefore, whether you need a party tent, wedding tent, or décor and drapery services, we will ensure that it has been customized to meet your desired needs. Our marquee hire service is also available in Umhlanga.